Monarch Air Group provides private air charter in Sioux Falls, SD. Our clients benefit from top-notch service, unrelenting dedication to safety, wide selection of aircraft, and years of experience in chartering private jets. To obtain a free quote, please use our online quoting tool provided below, or call toll free 1-877-281-3051. Monarch Air Group provides private jet charter flights in and out of Sioux Falls, South Dakota, USA. 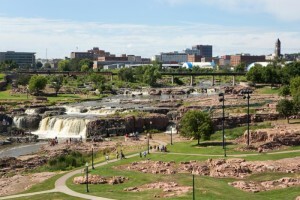 Sioux Falls is the largest city in South Dakota and an industrial and commercial center in the southeastern part of the state, on the Big Sioux River. The population of the city is about 153,888 people. Sioux Falls hosts Sculpture Walk, First Fridays, Festival of Bands, LifeLight Festival, Party in the Park, Jazz Fest, and some others. The most popular tourist attractions include Falls Park, St. Joseph Cathedral, Sertoma Butterfly House, Pettigrew Home & Museum, Washington Pavilion of Arts and Science, Old Courthouse Museum, Xcite Family Fun Center, and many others. The city is served by Sioux Falls Regional Airport (FSD / KFSD), which is located 6 miles from the center of Sioux Falls. 1. BKX, Brookings, Brookings, United States. 2. CTK, Canton, Canton, United States. 3. FSD, Joe Foss Field Airport, Sioux Falls, United States. 4. LRJ, Municipal, Lemars, United States. 5. MHE, Municipal, Mitchell, United States. 6. OTG, Worthington, Worthington, United States. 7. XMD, Madison, Madison, United States. 8. YKN, Chan Gurney, Yankton, United States. 1. Holiday Inn Sioux Falls-City Centre, 100 West 8th Street, Sioux Falls. 2. Holiday Inn Sioux Falls-City Centre, 100 West 8th Street, Sioux Falls.